As I was writing this blog post ahead of time, about a week ago, I had no idea that, ironically, this post would fall on the first snow of this season. It wasn't much; we have a very pretty dusting of snow on the ground and the trees outside. But snow is snow, and for what it's worth, there's some of the cold white stuff on the ground outside. But will there be a white Christmas here? I know I'm going to lose you northerners with this one, but here's the bittersweet truth about Christmas in the South: it almost never snows. In fact, the only reason I included the word "almost" is that I suppose it's remotely possible that somewhere, in some hilly hamlet of the South, it might have snowed on Christmas once in the last fifty years. But as a rule? Nope. No snow on Christmas if you live in the deep South. Contrary to what today's weather situation might suggest, we rarely get snow at all. There's today's dusting. 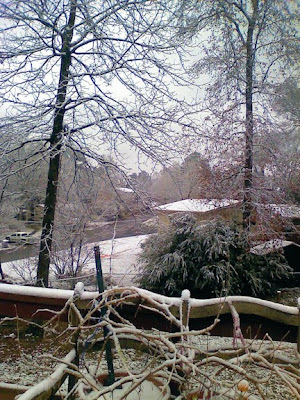 And we had about a half an inch here in central Alabama earlier this year; I even blogged about it. But there have been many years where we didn't see a flake. But snow is generally localized--you might get a band of heavy rain that hits just when the temperatures are low enough to produce snow, but it's never widespread, it's extremely rare, and it usually melts within hours. Down here in the South, we get ragged a lot about not being able to cope with snow. Whole cities shut down even with an inch or so of the white stuff. But in our defense, snow of any significance is so rare that trying to prepare the city for dealing with snow would be cost-inefficient. Why buy snow tires or snow chains when you almost never get snow? Why purchase and maintain snow plows when there's never any snow to plow? And how on earth could a Southerner hone his snow driving skills when he can go years without seeing a single flake? One of these days, maybe, if I live long enough, I'll see it snow on Christmas here in Alabama. I'm just not holding my breath. Does it snow for Christmas where you live ? Do you have any White Christmas stories? Share them with the rest of us.I'm going to randomly choose one commenter on this blog post to win a $10 Barnes and Noble gift card, so get to posting! If you're wondering what that tangle of vines is there in the bottom of the photo, that's what's left of last summer's tomato plants, left to go fallow over the winter. You can see a small orangish ball at the bottom right—that's a marigold bloom covered with a crust of snow. I live in Southwest Missouri. Sometimes we get snow for Christmas and sometimes we don't. I remember a few years ago we had a horrible ice and snow storm for Christmas and very few of us made it to my sisters for the holiday. My parents are elderly and were afraid to get out. Since my mother had a hip and both knees replaced she is paranoid about falling down. So it was a rather small celebration that year which we all hated since we only get together a couple of times a year. Hopefully this year the weather will be okay. I have a new granddaughter that fought hard to be here so we have a lot to celebrate. She was born at 23 weeks weighing 1 pound and 2.7 ounces and was 11 1/2 inches long. She spent 4 months in the NICU but got to come home in July. This will be her first Christmas. Also my youngest is expecting her third, so we will be celebrating that as well. It would be harder for me to reminder any *green* Christmas stories. . . . Harder for me to REMEMBER any *green* Christmas. Duh. Hey, Paula! Louisa in Wetumpka here. We didn't even get the dusting you got. I've had my share of White Christmases though. We were stationed in England for three years when I was a child and had wonderful White Christmases there. Then I lived in Germany for three years. Always a White Christmas and one year we even had a blizzard. Back in 1993 we did have a snowstorm here in Wetumpka around Christmas. You're right about everything shutting down. The thing is I came home from work the night before with no real warning about snow. I was off the next day, thought I'd get groceries on my day off. Woke up to a Winter Wonderland. And with my steep uphill driveway there was no way I was getting my truck up through the snow. At the time my horse, Taz, was still alive and he was dancing in his pasture like a young colt instead of a 20 year old Walker/Quarter horse cross. So being an inventive sort of Southern girl I saddled him up and rode him the 8 miles to town. Hitched him to the newspaper box outside Food World. Got my groceries and came out to find a police car next to Taz and an officer looking him over. I asked if I'd done anything wrong. He said "No, ma'am. I just wanted to know who rode the horse to town." Taz passed away in 2005 so I hope we don't get snow! Riding him in the snow is one of my favorite memories of him. Well, I'm from Mississippi and we hardly ever get snow. This past Friday they had snow in SOUTH Miss. but here in North Miss. not a flake!! People in the South, I've found don't do well in snow!! Wow, Linda--you have the best Christmas present of all! Congratulations on your new granddaughter. What a wonderful blessing, especially given how hard she struggled to be here. Louisa, Misty and Martha--I guess snowless winters are our cross to bear down here below the Mason-Dixon line, huh? At least we get the hot, humid summers.